Whether you’re 25 or 75, especially if you’re female – though males are not exempt! – we all have to deal, ultimately, with fading looks and how we “do Venus” over time. I don’t care if you never thought you were a glamour girl or a drop-dead handsome guy. Just take out your albums and look at your “young” pictures. Admit it. With few exceptions, you looked great then compared to now, especially if you’re past your midlife transits. It’s all relative. I, myself, am a Venus Girl through and through – Taurus Rising, Venus-ruled chart with Sun conjunct Venus and three planets in Libra. You’re probably laughing out loud at how typically Venusian we are, creating ambience by the yard, worried about our good looks and being beautiful – so into relationship, we can’t even have our faces fixed without each other. Whatever your astrological or bare minerals make-up, turning the corner on 40, 50 or 60 or beyond leads you smack into the issue of how you will handle aging from a cosmetic perspective. To one degree or another, we all bow – or refuse to bow – to the Goddess Venus. I don’t have all the answers. I think a lot of them are individual. Just like some girls go through a tomboy stage, others, like me, never had one and preferred dresses to pants from little girlhood. Some never got out of their tomboy stage, never were much for make-up and frills or high heels. That’s who they are – as natural to them as primping, preening, and color-coordinating are to me. I’m fond of the movie The Birdcage, especially its anthem of self-expression, the song I Am What I Am. In this 1996 comedy, Robin Williams stars as Armand, a gay cabaret owner. He and his drag queen companion, Albert (Nathan Lane), agree to put up a false straight front when their son wants to introduce them to his fiancé’s conservative parents. Her father is a U.S. Senator (Gene Hackman). As with all comedies, things go horribly awry. While I always thought Albert’s attempts to look womanly fell a little short, he manages to charm and convince the Senator, who is quite taken with him as “her.” But when the paparazzi threaten to storm the house conjoined to the cabaret and splash the Senator’s presence at it in the tabloids, it’s time for drastic measures. All bets are off; all secrets must be revealed. Albert rips off his wig and sings “I Am What I Am.” It’s a tune of the ultimate freedom – of self-acceptance. I hope I can sing it proudly, someday, when it comes to being what I am as a woman of a certain age. You can read poet Karen Lyons Kalmenson’s blog at My Heart – Musings and Confusings. This post is republished by permission of the author and originally appeared at The Radical Virgo. Karen Lyons Kalmenson’s poem is also reprinted by permission. Many of the Venus statues lack arms because they were hacked off by warring armies, seeking to discredit the Goddess and all she stands for. This is especially the case with the statues featuring snakes–symbols of feminine power–entwining around the Goddess’ arms or ankles. Thanks, Simone. Interesting to know that history. It explains why women suppressed overt expression of their power and went to more covert means of acquiring a power balance, like using beauty and “feminine wiles” to get what they want. Unfortunately, like all power tools, external beauty breaks down eventually. Inner beauty is as eternal as the spirit. Whether or not a person believes in multiple lives, our spirits live on in those who have loved us. I’m glad I live in a time where people don’t generally go around hacking the arms off statues that depict beauty or the feminine. I really enjoyed this article, Joyce, thank you for sharing! I am the opposite of a “Venus girl.” With a Rx Venus in Virgo in the sixth! What I’ve figured out though, is that I need to honor her in my life more. You’re so welcome, NR. Venus is valuable to a full life, no matter how we find her or express her. Beauty comes in all shapes and forms. I can think of several friends who are very natural, make-up free and no frills kinds of women whose beauty and kindness so shines through, they look like Venus herself. And Karen Lyons Kalmenson is spot-on: if we don’t feel and believe we are beautiful, then who else will? Thanks for your comment, Danielle. Your question involves clarifying some terminology. A trine involves 3 planets, usually in the same element (earth, air, fire, water) that are approximately 120-degrees apart. A person can have a trine to their Venus involving 2 other planets, but this does not sound like what you’re describing to me in your own chart. Another term is rulership and how we use it. Any of your planets in Taurus and Libra are “ruled by” Venus. 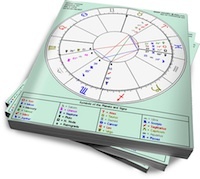 However, when most astrologers talk about rulership of the whole chart, they are talking about the sign on the cusp of the 1st house or Ascendant. If you have Libra or Taurus there, your chart is Venus-ruled. Your chart is Venus-ruled, too, if the planet Venus is in that location. “Chart ruler” is the term I’m zeroing in on here. i am very weak on venus but being strong on mercury and sun i am unapologetic anti aging devotee, since i was 18 years old. i believe in aging gracefully, but not in the venusian we-are-all-beautiful (on the outside) creeds. i think the differences are interesting – similar concerns but taken from the softer, pleasant, venusian pov and the more uncompromising, harsh, so-called ‘masculine’ planet pov. Thanks for the Mercury perspective, bis. I would have never thought about the difference of how masculine versus feminine planets would approach anti-aging until your comment. Thanks, again!